It’s a paradox but the term “process” remains the most ambiguous in BPMN, as the recent discussion on the BPM.com forum has shown. In our day-to-day life we call “process” almost anything from digestion to the formation of galaxies. Many consultants are comfortable with the process definitions that cover any orderly set of activites aimed at certain result. It makes sense when we focus on business performance but when we get into details it becomes hard to ignore the difference e.g. between processes and projects. One may treat a project as special case of a process indeed but the fact is that we manage projects and processes substantially differently so a definition that makes no difference between processes and projects would be counter-productive. That’s why I like the term “business capability” - it provides an umbrella term for different kinds of business activities yet it doesn’t merge them all into “process” treated too widely. Process definition narrows even more in BPMN context. First, there is a clear difference between a process and subprocess in BPMN: the former is triggered by external event (e.g. a message, timer or free will of process initiator) while the latter is called from overarching process or subprocess. Secondly, the entities more abstract than a single process are beyond BPMN scope completely. There is no element to model process groups in BPMN so one can’t depict things like “value chain”, “supporing processes” or “product promotion”. 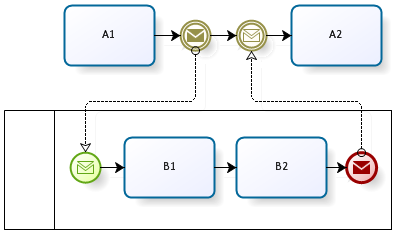 Lanes (known as swimlanes in BPMN 1.x) represent process performers in BPMN. Lanes may be nested (hierarchical). Embedded subprocesses do not have pools and therefore can’t have lanes. Lanes are meaningful only to the user tasks - service tasks, script tasks, subprocesses, gateways, events are irrelevant to which lane you put them in. Even for the user tasks the lane is essentially a comment - actual performer is defined by the model attributes of the given task. Figure 1. 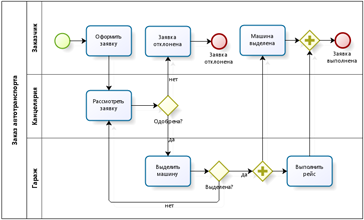 BPMN diagram with lanes. Figure 2. 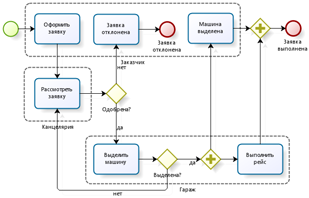 BPMN diagram with a happy path. Moreover, when dealing with large processes there is no room for lanes at all. Figure 3. “Flat” diagram with a large number of activities is hard to understand. Figure 4. 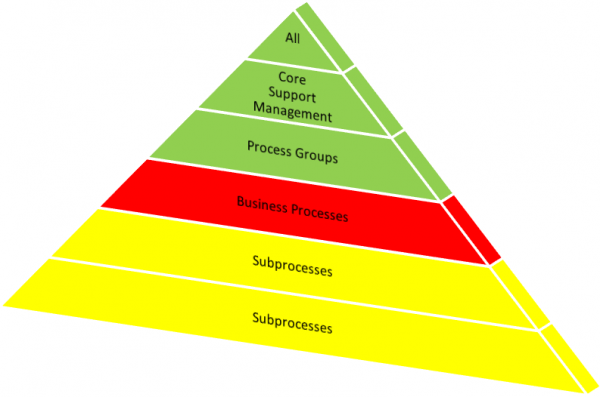 Subprocesses help creating a simple diagram from a complex process. At the top level there are only subprocesses while lanes apply only to the user tasks (rule 5). Subprocess diagram doesn’t allow pools nor lanes (rule 4). More precisely, rule 4 applies only to the embedded processes; reusable subprocesses may have lanes. I’ve seen diagrams where reusable subprocesses where used instead of embedded solely to be able to depict lanes. This is definitely bad practice - embedded subprocesses shall be used for the decomposition. Reusable subprocesses introduce additional complexity because unlike embedded they are executed in a separate data context. Figure 5. BPMN groups shows performers within the embedded subprocess.